THE GENESIS OF SANGAMO was not so much a scientific breakthrough as it was a shrewd observation by its founder, Edward Lanphier. After graduating from Knox College with a degree in biochemistry, Lanphier entered the business side of biotech and by 1995 was in charge of building the “patent estate” of Somatix, a California-based gene-therapy company. He was captivated by research at 4 labs studying the impressive DNA-binding utility of zinc fingers, especially work out of the Medical Research Council in London led by the Nobel laureate Aaron Klug, PhD. Somatix wasn’t interested, but Lanphier was: He licensed intellectual property from those 4 labs and set up laboratory operations of his own. Indeed, a year after its IPO, Sangamo acquired Gendaq in a transaction valued at $40 million. Wall Street may have sniggered, but Sangamo got the last laugh—that was almost certainly the most lucrative business move the company would ever make. Cofounded by Aaron Klug, Gendaq had been researching zinc fingers for 15 years. Sangamo added 16 scientists to its roster and acquired 22 patent applications, 2 issued patents, and $6 million in cash. “This consolidation of intellectual property and scientific assets catapults Sangamo into a unique position,” Klug said at the time. That leverage would go on to empower the company and embolden its critics. Sangamo’s first decade was devoted to proving the efficacy of zinc fingers as a viable medicine, and Gregory led a team that sought to discover whether zinc finger nucleases could edit genes in human cells. After 2 years of research, their work led to a landmark 2005 paper in Nature revealing that site-specific gene modification with a nuclease was possible in a human T cell without suppressing anything else detectable in the genome. “That was really the result everybody was waiting for,” Gregory says. “I have to say, we were very worried that we were getting tricked by the fantasy of the data. There had been a technology a few years earlier that had offered similar gene correction, but it turned out to be essentially an experimental artifact. So the supplementary data in our paper are just gigantic. We did every experiment imaginable to try to confirm that the data were real and not some artifact of the way we were measuring outcomes. Three months after that article was published, Sangamo was accused of controlling a “zinc finger nuclease monopoly” in a Nature article by Christopher Thomas Scott, a graduate student at Stanford who went on to direct the university’s Program on Stem Cells in Society. “[T]he secrets of a cutting-edge technology that could transform gene therapy lie hidden in the intellectual property vaults of a small biotech company.” The strategy makes financial sense, Scott wrote, but it could hinder advancement of the science and antagonize investigators, who might then pursue alternate technologies. During the mid-2000s, Sangamo did well over 100 material transfer agreements to make its technology available to other labs. 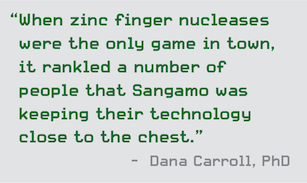 “What people don’t talk about when discussing our control of the IP was that it’s extraordinarily difficult to make the kind of high-quality zinc finger proteins that we were making,” says Lanphier, who retired from Sangamo last year. “So yes, there was a patent barrier to entry, but in reality there was a much greater technical barrier.” The threat, the company believed, was not only competition but also the potential of second-rate experiments to sully their product’s reputation. With about 175 employees and $90 million to $100 million in operating expenses, Sangamo is relatively small for its field, and so it must be, in Macrae’s words, “ruthlessly strategic.” When developing a treatment would be unreasonably expensive and beyond the biological expertise of in-house scientists, Sangamo has formed partnerships with other companies; for example, with Bioverativ for treatment of beta-thalassemia and sickle cell disease, with Shire for treatment of Huntington disease, and with Pfizer for treatment of hemophilia A. That Pfizer deal included an initial $70 million for Sangamo to search for candidate zinc finger proteins, the largest up-front payment for a gene therapy to date. In early January, Sangamo and Pfizer announced a collaboration to pursue treatment for a form of amyotrophic lateral sclerosis (ALS) that makes up about one-third of all ALS cases. Between its two deals with Pfizer, Sangamo is eligible to receive up to $625 million in milestone payments, along with royalties.